IMSAI was founded by an ex IBM employee, William Mallard, as a business called IMS Associates, Inc., in 1973. It was located in San Leandro CA. IMS stood for Industrial Micro Systems. They did contract hardware/software work for business and the government. One project they had was the development of a "Hypercube" -- a multiprocessor 8080 CPU system allowing parallel processing. As the project evolved they needed a disk operating system (hardware and software). Apparently they had difficulties with a CDC hard disk system and looked into developing a CP/M based system (then new) on an Altair computer. They were unsuccessful in working out an arrangement with Altair and so Joe Killian their chief engineer decided to build an Altair clone. They quickly found that there was interest and demand from computer hobbyists for such a system. In 1975 they made a name for themselves by providing a much better constructed "S-100" system utilizing sound engineering designs they had learned from the work above. The company took off. To finance rapidly growing operations, IMSAI pledged 20% of its stock as convertible note in exchange for $250,000 from the investment firm Marriner & Co. In 1976, in partnership with others IMS launched a successful computer reseller franchise ComputerLand. In 1982, ComputerLand's sales reached over $400 million and by 1984 the venture reached over $1 billion in revenue. However legal troubles from the failure of IMS, centered largely on a convertible note from the Marriner partnership that was later sold to a group of investors, led to a lawsuit in which Millard lost a substantial portion of his stake in ComputerLand. In the late 1980's Millard relinquished control of ComputerLand. In 1987, he sold ComputerLand to E.M. Warburg, Pincus & Co. for about $200 million. Apparently there were serious management problems at IMSAI almost from the beginning with large salary discrepancies between executives and staff compounded with unrealistic tasks and goals. In spite of its early start in the business it quickly lost out to other competing companies. 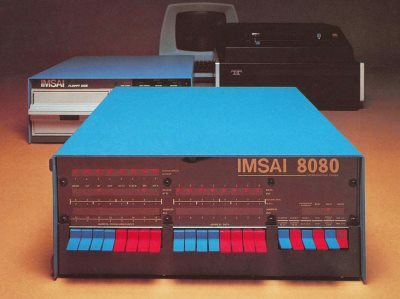 Nevertheless the IMSAI 8080 box to this day probably represents the image most associated with the S-100 bus. Over 15,000 of them were manufactured. Working systems on eBay have reached over $3000. The rights to the IMSAI name, materials, documentation etc have been obtained by a guy named Todd Fischer who started a company called Fischer-Freitas Company. He has a web site at http://www.imsai.net/ where he describes an IMSAI Series II. This is a S-100 bus/IBM-PC proto-type hybrid. Todd unfortunately is seriously ill -- we wish him well. Initially the main competition IMSAI had was Altair. The IMSAI was a superior machine in almost every respect from a hardware perspective. For example The Altair used a power supply rated at 8-amps and constructed of radio grade components. This was thought to be more than adequate for the original design of the computer, but not for an expanded system. The IMSAI power supply, on the other hand, came equipped with a massive transformer and very large computer-grade capacitors. The standard model was rated at 20 amps. This big power supply could deliver 30 amps at 5 volts and 3 amps at + - 16 volts. Having a large power supply was an advantage because all the S-100 Bus computers used un-regulated power supplies with power regulators located on each individual circuit board. One of the most common causes of failure in S-100 computers was failure of the on-board power regulators. The use of massive transformers and capacitors provided less electrical fluctuation and longer life for these power regulators. The product brochure for this system can be seen here. One most important thing the Altair had over IMSAI was the BASIC interpreter written by Bill Gates of Microsoft. IMSAI had little software capability initially. The only software they supplied was a modified version of a software package, written for Processor Technology and placed in the public domain. This was delivered on a paper tape and required 8K of memory. The software consisted of a executive program, including a text editor and an assembler program for assembly language. To use it, you had to have a teletype tape reader. Hardly the type of thing a non-computer hobbyist would use. IMSAI promised for months they would come out with their own BASIS. People got fed up waiting. Altair BASIC soon became the standard language for personal computers even before Microsoft got out of its restrictive agreement with Altair. In their favor however they early on appreciated the use of a disk operating system and quickly adapted CP/M for their system. One advantage they had however was the fact that almost all S-100 systems were not "pure". Most had a mixture of different manufactured S-100 boards. IMSAI sold many of their boards for use in non IMSAI systems. The company died a slow death by funds being drawn out of the operation to fund the ComputerLand franchise operation. They came out with a "all in one" box called the VDP-80. It looked great on the outside but was unreliable internally. It utilized the infamous Persci 8" floppy drives. The company never really recovered. The company closed down in October 1979 with some of the assets being sold to Fulcrum the rest to the company called Fischer-Freitas mentioned above. The manual for the above system can be found here. More useful information on the early IMSAI boards can be found here.